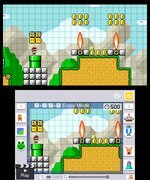 Super Mario Maker effectively gives you two games in one. 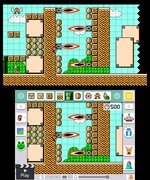 On the one hand, you can make and mix your very own levels, getting creative and trying to get into the mindset of a Nintendo designer. 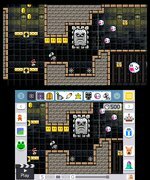 On the other, you get an supply of weird and wonderful new levels put together by the community to try your hand at. One of the first levels you'll play isn't one made by a mere civilian. 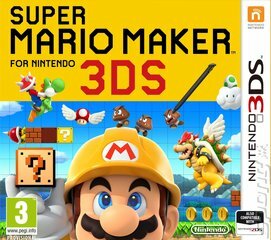 It's a remix of where it all started made by the team behind Super Mario Maker. Everything appears to be as you remember it. A '?' block, a Goomba, some more blocks, you know where the mushroom is. But here you're tricked. 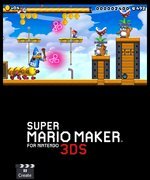 Everything looks as it should but you'll soon realise what Super Mario Maker is all about. Hit the mushroom block and a horn sounds, go down a pipe and instead of the usual shortcut you're treated to a room filled with disco lights as cannons shoot coins instead of bullets. It feels like a rom-hack and you can't help but smile as the levels you play constantly surprise you with twists on well known formulas. With level design handed over to the player everything's up for grabs. Some levels are traditional, others funny and there will always be sadistic level designers out there hell-bent on making things as hard as possible. It's simple to make a level, dragging elements down from the top of the screen and placing them in the grid below. A button on the bottom left allows you to test as you create and you have an option to study Mario's movements once you're back creating so you can tweak things and put them right. As you're creating, a warped version of your level's soundtrack reacts and bends to what you're doing. Little touches like this help make the creating process more of a joy than it should be without being patronising. As well as creation, the game also offers players a wealth of platforming content thanks to the option to download choice levels created by the community on the Wii U. There's tons of content here for even the most die-hard Mario fan!